"Hope to God We're Saved"
The gravel-laden whaleback Andaste might have been classified as a tramp steamer the day it sank with all hands in a Lake Michigan gale, somewhere off Holland, Michigan. Critics later said the 37-year-old boat was suffering from a lack of maintenance; her davits were so rusted that the life boats could not be lowered, there was no electric power, and she was not equipped with radio even though most vessels had ship-to-shore communications by 1929. The Andaste was identified by all who know it as a freak vessel. At least its profile was unusual. In addition to being one of Alexander McDougall's strange shaped whalebacks exhibiting a cigar-shaped hull, the boat had degenerated the the role of a sandsucker and carried a self-unloading system on its decks. All in all, the boat was just plain ugly to look at. Nobody will know what happened to the Andaste on September 10, the day a violent gale swept Lake Michigan and caught the vessel on what was supposed to have been a short trip from Grand Haven, Michigan, to Chicago. 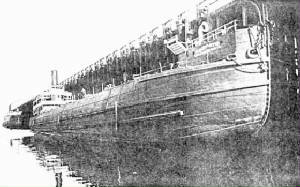 Some speculated that the old whaleback was done in when its cargo of 1900 tons of gravel shifted, causing the hull to break up. Others guessed that the crew might have been careless about battening down the boat's hatches for the short trip, and the gale carried them away. Killed were Capt. Albert L. Anderson and a crew of 24 sailors, many of them from Grand Haven. Earl Harrington, who lived near Ottawa Beach, said he watched the lights of a ship a few miles offshore during the storm. He said a heavy sea was rolling and the vessel appeared to be heading toward shore. He said that while he watched, the lights disappeared. Harrington's story was supported on September 13 when the fish tug Bertha G. discovered wreckage from the Andaste about 14 miles off Ottawa Beach. Among it was a door. Crew members George Evans and Joe Collins, who stayed behind when the Andaste left Grand Haven on its last voyage, identified the door and some attached woodwork. They said it came from Captain Anderson's cabin. Bodies began floating in on the fourth day. Among the pieces of wreckage that eventually drifted ashore was a plank with a note scribbled in pencil. It said: "Worst storm I have ever been in. Can't stay up much longer. Hope to God were saved." The note was signed with the initials A. L. A., indicating that this was the last message from Captain Anderson.